The term lowland castle or plains castle (German: Niederungsburg, Flachlandburg or Tieflandburg) describes a type of castle based that is situated on a lowland, plain or valley floor, as opposed to one built on higher ground such as a hill spur. The classification is extensively used in Germany where about 34 percent of all castles are of the lowland type. 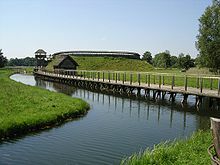 Because lowland castles do not have the defensive advantage of a site on higher ground, sites are chosen that are easy to defend, taking advantage, for example, of rivers, islands in lakes or marshes. Where such natural obstacles do not exist, artificially similar obstacles take on added significance. These include water-filled or dry moats, ramparts, palisades and curtain walls. In order to increase the height of the castle above the surrounding terrain, artificial earth mounds may be built (such as mottes), and fortified towers also fulfil this purpose. Castles of the Early Middle Ages (including Slavic and Saxon castles) often had a narrow, deep ditch and high and steep earth ramparts. 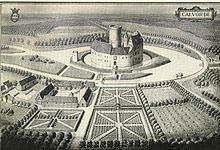 Lowland castles are naturally found on plains such as the North German Plain or in the Netherlands. But they may also be encountered occasionally in highlands, for example in a valley as a so-called island castle (Inselburg) on an island in a river (e.g. Pfalzgrafenstein Castle). River castles (Flussburg): a castle erected on a river bank. As a rule, they are also surrounded by moats filled with water supplied by the river. Shore castle (Uferburg): castle by a lake or the sea. Like river castles, shore castles usually have artificial ditches (moats) with a link to the waterbody. Island castle (Inselburg): castle on a natural, more rarely on an artificial, island in a river or lake. Marsh castle (Sumpfburg): castle in marshy or boggy terrain. It uses the natural inaccessibility of the terrain to its defensive advantage. Valley castle (Talburg): Castle on a valley bottom. A special variation are so-called Talsperren ("valley barriers"), where fortifications in the valley are linked to a hillside or hilltop castle so that this type consists of a combination of a lowland castle and a hill castle. An example are the Castles of Bellinzona. Bridge castle (Brückenburg): a castle built to watch over and protect a river crossing. Harbour castle (Hafenburg): a castle that is built to protect a harbour. This page was last edited on 4 January 2018, at 19:55 (UTC).